I have no idea what “brass rod” is, if two formats is hard to handle, I can’t imagine three. You’re a brave man. I mean his oldschool designs where it was literal brass rods sticking out of the instruments rather than jacks. 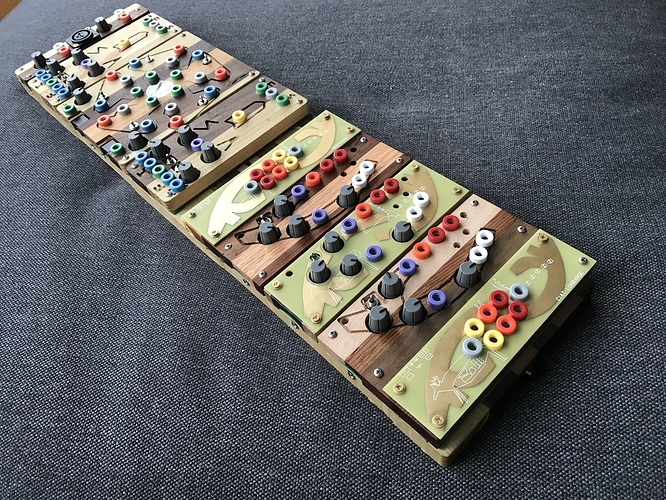 I think the barre controller is just passive, you could easily construct one yourself or build something else with piezos. I’ve not seen them for sale anymore, but I think it’s literally just a piece of wood with a contact mic on it. I think the IFM modules have inputs that can handle that just fine, but that it perhaps wouldn’t be a great idea to do that with other modules(?). Yeah that’s correct. Mind that it ducks very easily and a tiny bit of noise already cause the feedback to be completely muted. Cool, didn’t know he’d made PCBs for other paper circuits! Was it difficult in any way beyond the PSU issues? Touchable banana jacks sounds fun will have a look out for those. I’m not looking to build my own and it’d be fun to have a handmade wood item from Peter B. Read that pdf - yeah it does seem simple. I’ve never played a ciat lonbarde instrument, so I’m not familiar with how the wood feels. Does it bend or move at all? 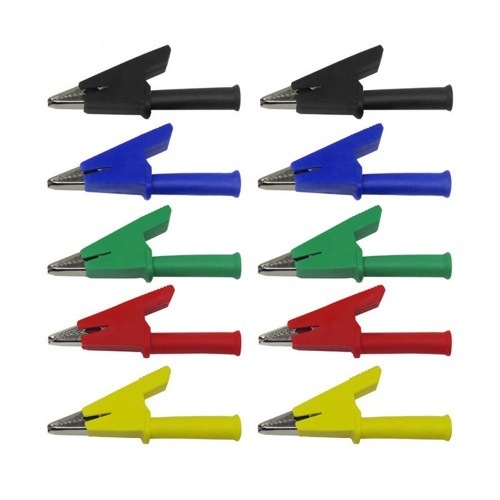 I’ve been using banana jack to alligator clip adaptors I bought on ebay with my CL stuff for a few years. They’re handy for me because I have banana cables anyway. These aren’t the exact ones I bought but close enough. Pretty surprising if you’ve not played one, but it doesn’t feel like it physically move at all. From the sound/look of it you would swear the wood was as wobbly as the sound, but it feels like just pressing on a table or desk or anything else. I’ve been using banana jack to alligator clip adaptors I bought on ebay with my CL stuff for a few years. That’s cool. Part of thing for me was that I didn’t have any banana cables (which are surprisingly expensive! ), so I wanted to incorporate it into my existing (alligator clip) workflow. Yes. They do require the investment in banana cables if you don’t have any already. I’ve generally found that Tom at Bugbrand sells the best value ones in the UK. If you do go for some banana cables maybe try him. Coincidentally I am buying a bunch of cables from him, but older DIY ones he no longer needs. So that worked out. My biggest issue with banana cables, other than their price, is that once I started using them I sort of lost interest in non-banana patchable synths. So now I’m building a Serge, buying Bug, etc and slowly divesting of the majority of my Eurorack format stuff except for the truly unique. We’ll see once I get them going, but for me the stacking paradigm seems so perilous. As in, I wouldn’t want to move a PB2 that’s patched up (more than a couple stacks deep) whereas with the alligator clips I would feel ok chucking it in a bag, since they would wiggle flat. Then again… I’ve not actually owned a banana cable before. I’m sure I read somewhere that there is a way of patching the Cocoquantus so that a loop is stopped or frozen, is this possible? Feed an audio rate oscillator (middle switch) from the quantussy into the skip of a coco and you’ll get this frozen, granular effect. One of my fav tricks on my Cocolase was to do something similar. I would ‘flip’ at audio rate, and have the gain all the way up. While doing this you manually control the speed knob, and you have, in effect, is a crazy wavetable synth where the audio-rate ‘flipping’ is the ‘pitch’ and the speed knob controls the timbre by deciding what the waveshape would be. This track is primarily that “synth” sound, feeding one channel of the cocolase into the other one for delay/looping. Thanks, I’ll give it a go. I did have the yellow square wave out going into the flip which was pretty much stopping it too. I’s actually be interested in ideas for using the square wave, it’s certainly got ‘character’ to it. I’ve just received my beautiful new cocoDEER and can’t wait to get started with it! Could anyone please recommend a psu for both?